The new options are Unique, Shared Folder, and Legacy. Choosing Unique places the derived data in a unique subfolder of Xcode’s derived data location. 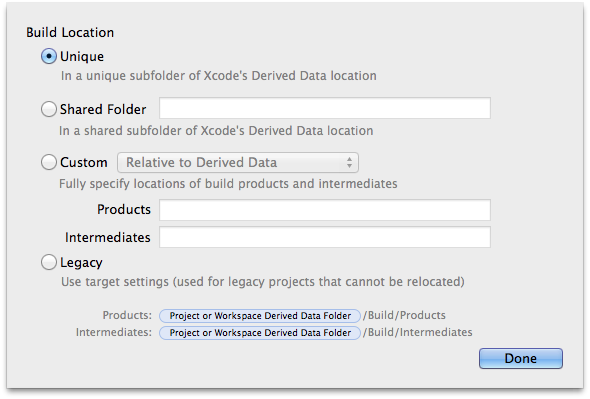 Choosing Shared Folder places the derived data in a shared subfolder of Xcode’s derived data location. Choosing Legacy lets you specify a different derived data location for each target in your project. Use the Build Products Path build setting to specify the build path for each target in your project. Choosing File > Project Settings and clicking the Advanced button lets you customize the derived data location for a single project.